The Colorado Rockies lost in brutal fashion Wednesday night against the Los Angeles Dodgers. Colorado fans are upset to say the least and reaction probably would have been worse had the game been on local television. Criticism of the Rockies has been fair. However, fans need to put this loss in its proper place. Fans are still holding on to hope that Colorado will make the postseason this year and seem to think Wednesday night’s result somewhat affected things. The truth is Wednesday night’s game had more of an impact on the Dodgers than the Rockies. Colorado’s postseason chances went out the window earlier in August with series losses to the Miami Marlins, Texas Rangers, Philadelphia Phillies and Milwaukee Brewers. The Rockies enter Sept. just 64-69. By comparison, Colorado was 72-59 entering Sept. in 2009 when they last made the postseason. In 1995, when the Rockies first made the postseason they were 60-56 going into Sept. in a strike shortened year. Even in 2007, Colorado was still 69-65 entering this month prior to going on one of the best late runs in MLB history and making the postseason by winning a play-in game. The postseason party is over and was over prior to Wed. night’s debacle. That does not mean that fans have been wrong the past day. The loss against Los Angeles cannot be justified. It is just pointless to say the loss impacted Colorado’s postseason chances. Next year will only be a success if the Rockies truly learn from games like this. The team really does have the talent to do special things. 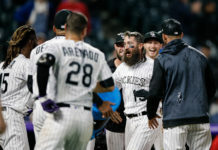 However, two of the major issues with the team this season have been Colorado’s inability to close games on a consistent basis and the Rockies under performing against teams that they should beat. These issues really seem to be on Walt Weiss. The Rockies are young and Weiss deserves a chance to begin next season as Colorado’s manager given the fact the Rockies have competed when many thought they would not. It seems like the players enjoy playing for Weiss and have a healthy respect for him. However, if we begin to see these same traits again next season the organization needs to make a move and make a move quickly. Growing pains are expected when the team is beginning to get good, but are not tolerated when the team is good. Catch Weekend Drive with Sean Walsh every Saturday and Sunday from 2p-4p on Mile High Sports AM 1340 | FM 104.7 or stream live any time for the best local coverage of Colorado sports from Denver’s biggest sports talk lineup.